Motorists have paid at least £1.3m in penalty charges for driving through a bus gate in Glasgow, according to figures seen by BBC Scotland. The gate at Nelson Mandela Place in the city centre was put in place by Glasgow City Council at the end of June 2014. Nearly 70,000 charge notices were issued to car drivers between then and the end of July this year. But, more than a third of those fined have not paid up. Councils say the gates aid public transport efficiency. The fines paid by drivers who used the single bus gate during its first year were greater than the total amount of bus gate and bus lane fines in both Edinburgh and Aberdeen in 2013. Cars were banned from driving through Nelson Mandela Place - close to Buchanan Street, George Square and Queen Street railway station - in a bid to help cut down on traffic in that part of the city centre. Taxis, delivery vehicles, buses and emergency vehicles are still allowed. Initially some drivers complained that the move was not well publicised and claimed the signs warning of the bus gate were inadequate. Some also wrongly assumed that the gate was a temporary measure during the 2014 Glasgow Commonwealth Games. If a motorist issued with a notice pays up within 14 days, they are charged £30 - and most do pay up within a fortnight. If they pay up later, they are charged £60. 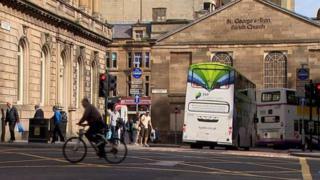 Councils across Scotland are adamant bus gates are only put in place to help the environment and public transport, and strongly deny claims from opponents that they are a source of revenue. Even the £1.3m from Nelson Mandela Place is still a drop in the ocean compared to Glasgow City Council's annual budget of more than £2bn. In July and August last year, 30,000 notices were issued to motorists. The number then fell substantially in September to 5,000 and has gradually declined since. Approximately 10,000 notices were served between April and July this year - 2,334 of them last month. If all the motorists who received a notice last month pay up within 30 days, the fines will total £70,000. Councillor Alistair Watson, Glasgow City Council's executive member for Sustainability and Transport, said: "One of the aims of the bus gate is to reduce the number of vehicles travelling through the city centre, while improving provision for public transport. "There is always a period of adjustment when new restrictions are introduced. It's clear from the reduction in offences that drivers are aware of the bus lanes and have modified the route they take. "The majority of the city's drivers won't receive bus lane charges since they don't drive through what is now a well-known and very visible bus gate. "The number of offences has dropped significantly and hopefully we will see even further reductions. Most drivers contravening the bus gate pay the penalty within 14 days which reduces their fine to £30." In 2013, Edinburgh City Council received £718,000 from bus lane fines while Aberdeen City Council received £896,000. That year Glasgow received a total of £3,283,776.